Andrea Albanese is Social Media Marketing and Digital Communication Advisor, Project Manager, Community Manager. He’s Professor in IUSVE (Istituto Universitario Salesiano Venezia e Verona), Professor at the Business School of IlSole24Ore, Professor at the Digital Innovation Observatory of the Politecnico di Milano, Professor at CentroStudi Giornalismo e Comunicazione di Roma. In the past, he has conducted some researches on the use of Social Media in Companies for SDA Bocconi and SNID (Social Network Influence Design) Master Poli. Design of Politecnico di Milano, of which he was also a lecturer and member of the scientific committee. 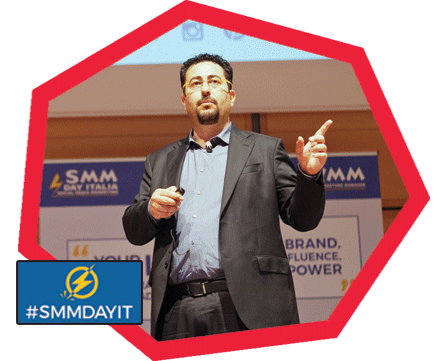 He is the organizer of’ Social Media Marketing Day Italia’ #SMMdayIT, the leading event in Italy on Social Media Marketing and Digital Communication, entirely B2B. Founder of the’ Centro di Competenza Permanente Social e Digital’ in Milan. Within its areas of reference, it conducts research, training and consultancy activities for private companies and Italian public organizations.